The jury of ECHO Klassik 2013 awarded him „instrumentalist of the year” and thereby gave one of the most important European music awards for the first time to a tuba player. Andreas Martin Hofmeir, who at present is certainly one of the best and most versatile instrumentalists, loves to commute between different genres: the 38-year-old professor teaches at the Universität Mozarteum Salzburg, founded the popular Bavarian band LaBrassBanda and is a multiple award-winning cabaret performer. He is a sought-after soloist and chamber musician and gives master classes all over the world. Born in Munich in 1978 he studied in Berlin, Stockholm and Hanover. In 2004 he won the prestigious “Città di Porcia” International Tuba Competition and – as the first tuba player ever in the history of this competition - the prize of Deutscher Musikwettbewerb in Berlin in 2005. He received a scholarship from the orchestra academies of the Berliner and Münchner Philharmoniker. 2004 to 2008 he was Solotubist with the Bruckner-Orchester Linz under Dennis Russell Davies. As a soloist he performed with the Münchner Philharmoniker, Rundfunk- Sinfonieorchester Berlin, Konzerthausorchester Berlin, NDR Radiophilharmonie, Bruckner Orchester Linz, Orchester des Nationaltheaters Mannheim and many others. With the harpist Andreas Mildner he founded the first tuba-harp duo in the world. Together they appeared at noted music festivals, such as the Schleswig-Holstein Musik Festival, Festival Mitte Europa and Ludwigsburger Schlossfestspiele. Apart from his classical career, Hofmeir has also been standing on stage as a cabaret artist for seventeen years. Presently he tours with his musical-cabaret-reading “Kein Aufwand!”. He is show master of his own cabaret show „Wer dablost's?“, in which artists of different genres perform, talk and try to blow the antique, malodorous tuba Rosalinde. With his band LaBrassBanda, which he joined until end of 2013, he stormed the top ten of the German charts with their third album “Europa” (Sony). In 2013 LaBrassBanda played for about 500 000 people during their Germany tour. As cross over artist Hofmeir increasingly links classics, jazz and cabaret in exceptional programmes, in which he is on stage as classical soloist, moderator, actor, cabaret artist and jazz musician. His current cross over project “All About That Bass” was performed with great success last year in Gasteig in Munich. His CDs “Uraufnahmen” with recordings of the tuba concertos of Duda, Näther and Roikjer (ECHO Klassik 2013) and “Why not?” with works for the tuba-harp duo have been released by the label Genuin. His new solo album “On the way” (Sony) with the Münchner Philharmoniker under Andrew Manze came out in March 2014. 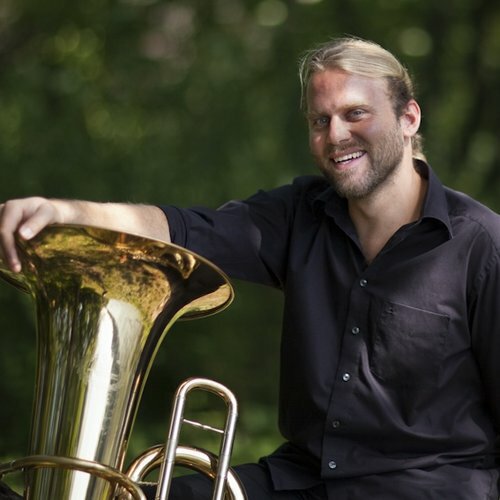 Andreas Martin Hofmeir plays B&S tubas.